**A 2012 Edgar Award nominee** and **A 2011 Agatha Award Nominee** Oona Crate was born to be the Wizard’s apprentice, but she has another destiny in mind. Give me Oona Crate any day! I absolutely loved this book! It was a fantastic ride through a magical (or magic-less) world with twists, turns, and sudden drops. Oona Crate possesses Natural Magic, but doesn't want it. She wants to be a detective like her father was. She needs to help her uncle, the Wizard, find a replacement for her as Wizard's apprentice then. 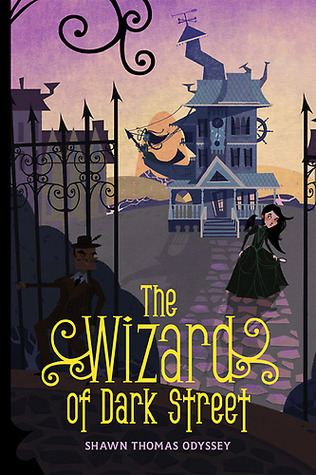 But, just as she's about to sign away her apprenticeship, someone uses a magical dagger on the Wizard and what happens next is a mystery which Oona will have to unravel to save the Wizard, Pendulum House, and all of Dark Street! The world of Dark Street is beautifully constructed. The mystery is age appropriate (but also enjoyable for adults) and is a wonderful roller coaster ride that will keep you guessing until the very end. I thoroughly enjoyed this book and cannot wait to read more about Oona Crate!! Oh I love middle grade mysteries! This sounds really fun too, with the magic (or magic-less) involved. This looks like such a great book! Will definitely have to get this one for the kids and I to read together! I looooove the cover! I really like it when they choose such artwork.